Green air conditioning, lighting that learns the habits of the residents, ventilation that automatically matches the temperature to our mood or kindergartens where sensors monitor the number of bacteria and send messages to parents – all this is no longer a projection of a futurologist but just a fragment of what the Campus of New Technologies will offer in two years’ time. The Campus will be Europe’s largest smart living lab complex. This infrastructural project to develop the living lab complex has recently acquired EU funding. The project’s leader is Warsaw University of Technology, its operator – Pro Development, with other major stakeholders including such tech giants as Samsung, PGE, Somfy, Nowy Styl Group or ML System. The facilities will be built close to Warsaw’s Pole Mokotowskie park and in Warsaw’s suburbs, with opening planned for 2020. The Warsaw-based Campus of New Technologies will be unique thanks to the scale of the endeavour and the possibility to integrate comprehensive smart living solutions for contemporary urban workers and dwellers within one living laboratory. The complex will consist of about a dozen buildings with adjacent public spaces located in the reclaimed ground close to the main campus of the Warsaw University of Technology and in Zamienie, in Warsaw’s suburbs. The total floor space of the project amounts to more than 300,000 square metres. The complex will therefore be a city within a city, where the residents, scientists and entrepreneurs jointly create, test and improve real-scale smart living technologies. – The Campus is on the one hand a giant leap forward in policy to turn Warsaw University of Technology into a research university, in accordance with the “University 2.0” programme – explains Åukasz Madej from Pro Development, the business partner in the Campus of New Technologies Project and the project’s operator. – We’re planning to focus on five research areas linked to everyday life in the city: smart urban spaces, smart buildings, smart homes, and Factory 4.0 i.e. business plants of the future where all processes from product design to market launch are radically shortened. We also want to look at the resulting social changes which follow the development of smart technologies. For the first time, one open-access urban zone will bring together residents, scientists, students, enterprises and local authorities, all of whom will be willing to cooperate. Warsaw’s Campus of New Technologies will offer, among other features, buildings with complete hi-tech and sensor-based solutions including residential, office, commercial, services, co-working rooms, informal meeting zones, hallways, parking lots, elevators and all that is necessary for everyday life, work and leisure in the city. 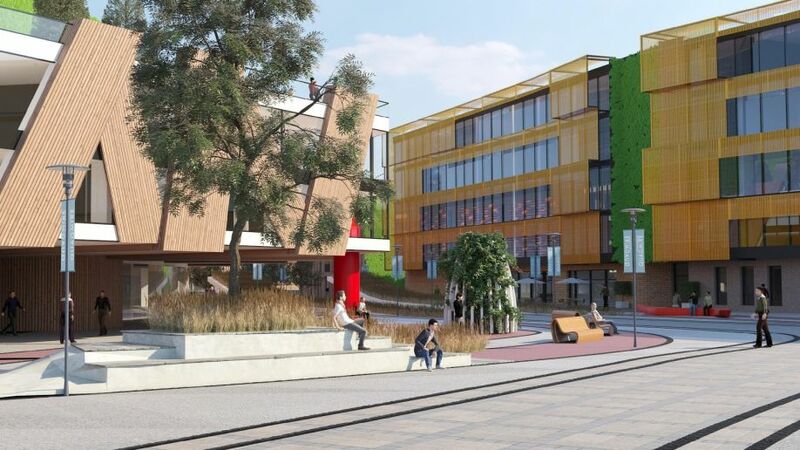 Some companies are already interested in using the Campus buildings to test the use of quantum dot solar cells, bio-climatic façades controlling the temperature, lighting and ventilation, and smart furniture, tele-medicine or integrated education. Moreover, Warsaw’s living lab will also feature test versions (with installed sensors) of open spaces, including squares, streets, fully automated parking lots, leisure areas and bicycle rental systems, security systems as well as other systems which increase the perceived comfort of the users. The living lab’s icing on the cake will be its top-class clean rooms for prototyping of smart furniture and intelligent white goods. Currently, 62 researchers from 9 faculties of Warsaw University of Technology are involved in the development of the strategy and schedule for the project. They are supported by teams from the Centre for Innovation and Technology Transfer Management and the Centre for Advanced Materials and Technologies (CEZAMAT). Additional assistance is provided by nearly 100 subject matter experts from R&D departments of leading tech companies which take part in the project. The project has been planned since 2015. So far the endeavour’s 25 core team members have analysed 15 leading technological parks in Poland and worldwide; they have also conducted interviews and workshops with international living lab experts representing, among others, the University of Cambridge, Harvard University, Technopolis, governments, regions, businesses including potential technological partners, and non-governmental organisations. As a result of this effort, the Campus has obtained funding from the Regional Operational Programme for Mazowieckie Region for the years 2014-2020 and has scored the highest number of points from among all the successful projects in the field of R&D infrastructure for research institutions. The project has also been included in the list of strategic investments as part of the Territorial Contract i.e. a contract concluded between the Polish government and the authorities of Mazowsze region. The infrastructure of the Campus of New Technologies will be used by about 100 entrepreneurs and companies implementing a total of 70 R&D projects. According to estimates, an average of about 10 research outcomes will be commercialised here each year, with a corresponding number of patents and trade marks. Such a massive endeavour requires not only the huge research capacity of Warsaw University of Technology but also a different approach to project management: one that will develop the university’s entrepreneurial culture and anchor the innovations through cooperation between business and the academia. Moreover, the method must also facilitate finding new sources of financing. That is why, for the first time in its history, the University is implementing this project as public-private partnership in collaboration with entities from beyond the public sector. The University’s business partner in the endeavour is Pro Development. The company has developed an original method of designing, constructing and management of space in order to creates optimal conditions for the development of innovation and utilize mixed functionality while engaging all users of the environment. Moreover, Wilson & Brown, a global tech company with 6 R&D centres and production plants on 3 continents, has also joined the consortium. The financial contribution of the consortium members amounts to nearly PLN 40 million. They also contribute in the form of ownership of the plots of land where the living lab will be developed, in ZamieÅ„ near Warsaw. At the stage of research agenda drafting, the Campus project was joined by 11 more business partners. including such technology giants as Samsung, Polska Grupa Energetyczna, Somfy, ML System, Swegon or Nowy Styl. All of these companies are interested in working on innovative projects in the domains of smart cities, smart buildings, smart homes and Factory 4.0. Their participation in the Campus of New Technologies project will let them significantly reduce the duration of incubation, design, development, prototyping and implementation of products and services, thus ensuring a faster “concept to production” process. Barcelona, Berlin or Copenhagen are locations where living lab projects have been consistently implemented for many years now. Such projects have significantly increased the development potential of entire regions, but most importantly they have improved the quality of lives of the local residents. This has been possible because one of the key premises of the living lab concept is to root the innovation in the society. Innovation, therefore, is meant to involve not just researchers or entrepreneurs but, most of all, the region’s community. – Poland, with the central region of Mazowsze in particular, has the highest number of graduates of technology and research faculties employed at regional innovation clusters. However, if we compare the levels of investment in R&D, we are still trailing behind such countries as Latvia, Estonia or the Czech Republic. As a number of reports have indicated, the biggest barrier to our region’s further innovative growth can be the fact that companies from the region are often reluctant to cooperate with universities – and joint endeavors of business and academia are of key importance for the implementation of disruptive innovation. The Campus of New Technologies, as Europe’s largest endeavour of this kind, will radically change the landscape. The resulting benefits for Warsaw, Mazovia region or even Poland can be huge – claims Åukasz Madej. According to recent comments on the reform of Poland’s tertiary education system issued by the Ministry of Science and Higher Education, “Without modern universities there is no development – neither social, nor intellectual or economic. Without modern universities there is no future for Poland. (…) Over the last two years we have managed to overcome the tendency which produced horrible results for Poles, i.e. the tendency to only talk about research quality or innovation without taking actual efforts to remedy the situation. The current change of approach is not just a political slogan or PR rhetoric: we are already able to indicate implemented and active solutions that are starting to build a cohesive and effective system composed of legislation, legal provisions, institutions, incentives and programmes which, among other benefits, will prevent Poland from falling into the “Middle Income Trap”. In order for Polish economy to compete with the leaders in innovation such as Finland or Sweden we need not only state-of-the-art research infrastructure, knowledge and funds, but also, even more importantly, the right approach and the right management skills. The Living Lab will create an opportunity to stimulate the development of innovative projects, establishment of new companies and implementation of solutions which will improve the quality of life in Warsaw and the entire region. Of course, in order to develop such costly projects we need infrastructure, and that is precisely what the Campus will offer. The living lab concept was developed at the world-famous MIT, where a team of researchers led by Professor William Mitchell noticed that new technologies can be developed, tested and implemented much faster if the process takes place in an environment that is as authentic as possible, with the local residents as the first and most important group of users and, consequently, co-developers of the solutions. According to the MIT method, technologies must be developed for people and by people in their place of residence, work or leisure rather than in a sterile and hermetic science lab. Since the breakthrough idea came to life there have been hundreds of living labs developed worldwide, specialising in different areas, e.g. energy efficiency or prototypes of production and assembly lines.